After several days of wrangling, trade talks between the Dallas Cowboys and Tennessee Titans for suspended cornerback Adam “Pacman” Jones have stalled, with Jerry Jones balking at the Titans’ demands for the high-risk, high-reward player. DMN’s Todd Archer argues that the Cowboys might be over-valuing their draft picks. 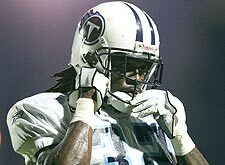 The Titans want a fourth-round pick in 2008 and another second-day draft pick in 2009, while the Cowboys are countering with their sixth-round pick this year, which is the first selection in the round because of the trade that sent Jason Ferguson to Miami. Should the Cowboys give up a fourth-round pick for Jones? Since 2000, the Cowboys have drafted Kareem Larrimore (2000), Markus Steele (2001), Jamar Martin (2002), Bradie James (2003), Bruce Thornton (2004), Marion Barber (2005), Chris Canty (2005), Skyler Green (2006) and Doug Free (2007) in the fourth round. Of those nine, only James, Barber and Canty have developed into starters (Free remains an unknown after seeing little to no action last season). A fourth-round pick might be worth it if you’re batting .333 in the fourth round over a seven-year period. How about a fifth-round pick? Since 2000, the Cowboys have drafted Michael Wiley (2000), Matt Lehr (2001), Pete Hunter (2002), Sean Ryan (2004) and Pat Watkins (2006) in Round 5. Lehr remains in the league as a backup. Hunter now plays for the Desperados in the Arena League. Ryan signed as a free agent with the Dolphins after being traded to the New York Jets and Watkins remains a potential starter here down the road. Would you give up a fifth-round pick for Jones? Of course, this shouldn’t be looked through such a narrow window. There have been success stories with late-round picks through the years, but those teams also say if they were so smart at drafting one of those players so late, they would have taken them earlier in the draft. There is a huge element of luck â€“ even with the money spent in scouting â€“ involved in a draft, especially in the second day. The Cowboys shouldn’t just give the pick away, especially with Jones under suspension and there being no guarantee of his reinstatement this year. But they do have a major need at cornerback. Even if they land Jones, it’s likely they will take a cornerback with one of their two first-round picks. Teams need at least four corners to be successful. Right now, the Cowboys have two in Terence Newman and Anthony Henry. Jones would make a third, either as a starter or the third corner. The Titans have to understand the risk the Cowboys are taking here, too. They have all but said he will not play for the Titans again and, unfortunately for them, there does not appear to be another team involved to create any leverage. They risk getting nothing for Jones if they end up cutting him. Teams are built through the draft. Of the Cowboys roster that ended the 2007 season, 30 came through the draft and half of them came from Rounds 4-7. Five of them were starters in the playoff game against the New York Giants. So let’s ask it again: Do we overrate draft picks? If it were simply a matter of finding good players, it would almost always be smarter to trade draft picks for proven talent, especially if the player in question is relatively young. For example, the Cowboys are hoping to trade their 1st rounder this year, number 28 overall, for a star wide receiver such as Detroit’s Roy Williams or Arizona’s Anquan Boldin. Given that they’re studs and aged 26 and 27, respectively, that’d be a no brainer. It’s not that simple, though. Just ask the Washington Redskins who, until this offseason, have been willing to trade away all their draft picks for players. Why? The salary cap. Yes, it’s very hard to find a starting caliber player in the 4th and 5th rounds. But, when you do, you’ve got a guy who’s relatively cheap locked down for several years. Veterans, especially talented ones, are costly. The most successful teams in the salary cap era, then, are the ones who consistently draft well and sign their own best players to long term deals early in their career. And ruthlessly cut expensive players as they get older. Sure, they sign free agents. But, mostly, it’s role guys they can get for cheap or maybe that one star player who’s willing to give a discount to play with a serious Super Bowl contender. Were I Jerry Jones, I’d be willing to take the deal the Titans are allegedly offering — but in the other direction. Give the Titans a 6th round pick this year and a conditional pick — say, a 7th that could move up as high as a 3rd — next year depending on how Pacman performs. A 4th rounder this year is just too much to give for a guy who we don’t even know will be eligible to play, let alone stay out of trouble — much less whether he’ll be able to return to star form after a one year layoff.